Tigerair Australia will operate three times weekly flights between Melbourne and Coffs Harbour from December 9. The new flights will depart Melbourne at 9:05 am Mondays and Wednesdays and at 08:45 am on Fridays, returning from Coffs Harbour at 11:25 am and 11:05 am respectively, adding 1,080 seats a week to the north coast NSW regional centre. “Tigerair has shown, once again, huge confidence in Coffs Harbour Regional Airport and the region with this latest new route announcement,” Coffs Harbour Mayor, Councillor Denise Knight said in a statement. Tigerair has been flying to Coffs from Sydney since February 2013. 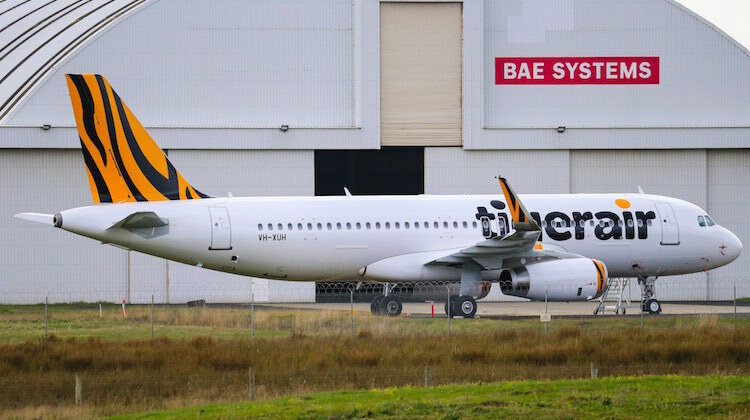 Meanwhile, Tigerair took delivery of its 14th Airbus A320, the Sharklet-fitted VH-XUH, in Melbourne on Tuesday. The aircraft, pictured above outside BAE Systems’ Melbourne maintenance hangar on August 25, will enter service shortly and from December will be based in Sydney in support of recently-announced additional weekly return flights from Sydney to Whitsunday Coast, Cairns, and Adelaide. Interesting that Townsville has never made it onto the Tiger radar. Virgin only services the market on the obligatory Brisbane and Sydney trunk routes, whilst the Virgin family completely ignores Melbourne, or other destinations like Perth, NZ or even the new Brisbane West Toowoomba. Given that Cairns, Whitsunday, Mackay and ports like Ballina-Byron and Coffs Harbour are considered worthy of services it seems a arrange omission given Townsville’s population base exceeds all of those locations. Chuck, Population base is only one criterion for services. You also have to look at the customer base. TSV is very DoD heavy, thus BNE and SYD are good choices and offer logical connections to CBR, MEL not so much. If there was the market they’d be serving it. Guys, I would have to say that JQ is the only airline servicing TSV direct from MEL. Initially it was a few times a week on a A320 but has the market grew it went daily. Succeeding further, it has been upgraded to a daily A321 service, which added 40 more seats. Load factors on this direct A321 service are always at or above 80%. Clearly there is a market for direct MEL-TSV services, which at this stage JQ is enjoying a monopoly on. Interesting. I wonder if Port Macquarie – Melbourne might be on the radar? Port Macquarie airport has been recently upgraded with runway lengthening and widening as well as expanded RPT apron. Can now comfortably accommodate 737/A320 ops probably similar to CFS. Although the PQQ terminal could do with a further expansion to cater for a fully laden jet without being congested. Although this is on their master plan as well as a full length parallel taxiway. As a Port Macquarie local I could see the advantage of a direct MEL service without needing to go through SYD. I know the local authorities here are trying to talk it up. Although for the moment if I need to go to MEL I may well try going via CFS if PQQ doesn’t get up beforehand. I would love to see Tiger Air A320s (or any jet aircraft) operating out of Port Macquarie. I would also like to see Tiger Air flying out of Canberra again. @Aden – Yes I would dearly love to see any jets in PQQ. We did have the Virgin E-jets years ago (and that was before the runway and apron extension was completed) but then they switched to ATR-72. The ATRs are comfortable but noticeably slower than a Q400. It would be awesome to see an A320 at PQQ though. There seem to be an lot of Victorian/Melbourne expats living in Port Macquarie, so there probably would be market demand for a direct PQQ-MEL service. Also don’t know why Tigerair don’t operate to CBR, you’d think there would be a market, but maybe there’s just too much premium traffic for a LCC. If Adz’s information is correct, then it would seem that there is a large market being serviced by only one carrier. Rather odd given the cut-throat market in Australia. I would have to agree that TSV seems to generate less faith from the airlines than other ports. The passenger numbers are stuck around the 1.7 million pa figure and have been for quite some time, yet load factors are always very high. And this despite other centres showing considerable growth off the back of new routes and airlines. Perhaps the lack of traffic growth comes because the airlines don’t always like “growing a market”. Virgin tried in Townsville for some time, but never gave the city linkages that were probably essential to making it a complete success as a focus city – like international services from TSV to NZ, or direct services to Melbourne. In the context of Tiger servicing places like Mackay, Whitsundays, and Coffs Harbour then it would seem a pretty big insult to suggest that Townsville has no credibility as a tourism destination, given all that surrounds the city like Magnetic Island. Qantas & Virgin would never let Jetstar & Tiger operate to CBR(again) as all CBR routes are very high yield & they don’t want to have any leakage to LCC’s. With Tiger about to start trans-Tasman services a TSV/AKL or TSV/CHC twice weekly service might be the go. Is there any curfew at TSV ? They could start with back of clock services, when aircraft otherwise parked. TSV currently 04:30 to 23:00, but those hours are determined by provision of service capacity, rather than a curfew. The Jetstar TSV-Bali flights are scheduled for a 22:55 departure. A midnight departure from Townsville would be close to a 06:00 Auckland arrival, so red-eye timings work.